Dry skin can occur anywhere on the body including the lower legs, thighs, arms and the sides of the abdomen. Dry skin leads to loss of moisture in the skin, along with itching, irritation, peeling and cracking. While being good for overall skin health, essential oils are an amazing remedy for the healing of dry skin. These biologically active substances can penetrate all the layers of the skin, breaking down the adhesion between the skin cells and encouraging the removal of dead skin cells, making them a perfect ingredient for parched and dry skin. 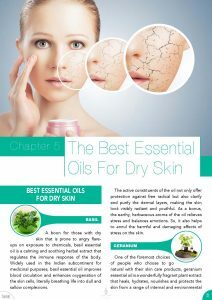 Having said that, here is all you should know about treating dry skin with the use of essential oils. What Are The Best Essential Oils To Use For Dry Skin? The essential oil of palmarosa is a must have in your skincare repertoire. When you are facing dermal dryness or for dealing with early signs of ageing, this is the essential oil that will come to your rescue. When added to your regular moisturizer, this essential oil is able to fix any kind of skin imperfections and provides ultimate protection and healing properties. Rosehip is one of the most used and known essential oils for dry skin due to its ability to regenerate the skin and remove dead cells. If you have dry skin along with stretch marks, it is always recommended for you to use this essential oil. There will be quick improvements and your skin will become blemish free. In addition, you can also bank upon the essential oil of Rosehip for treating your acne. The essential oil of patchouli is a given in any dry and anti-ageing blend. If you are troubled with dry/flaky skin, this soothing oil will provide immediate relief whilst revitalizing and toning your skin. 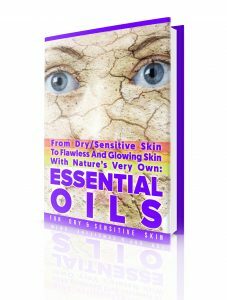 Have you wondered about the best and most effective essential oils for dry and/or sensitive skin. What Are The Best Carrier Oils To Use For Dry Skin? While being excellent at removing any impurity or imperfection in the skin, Coconut oil is perfect for issues related to dry skin. Applying a little of this oil tones your skin instantly. In addition to treating dry skin, this is also the oil I use for keeping my hair healthy. Over time, it is normal for our skin to become less smooth and go dry. The use of Argan oil is ideal for moisturizing aging dry skin. Massaging a little amount of Argan oil on your battered skin will make it more elastic and smooth. Jojoba oil is excellent for treating dry flaky skin. Thanks to its properties, jojoba oil prevents loss of moisture and balances hydration of your skin layers. In addition, it improves skin tones and elasticity and helps catch the early signs of ageing. 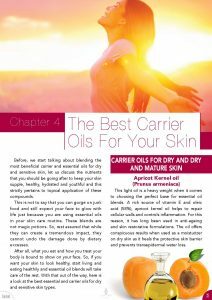 Why not get the full list of the best and most effective carrier oils for dry and/or sensitive skin. In order to hydrate dry skin, it is important to improve its metabolism. Improved metabolism facilitates the process of cell regeneration and strengthens the cell membrane. Some of the best essential oils fit for this purpose include orange, geranium, chamomile and jasmine. Rough skin is a major problem for people with dry skin. Essential oils that can help smoothen dry skin include geranium, tea tree, rosewood and lavender. In order to improve facial muscle tone, some of the best essential oils I have tested include myrtle oil, sandalwood, chamomile, rosewood, orange, jasmine and geranium. Your skin going dry is an obvious sign of a weak immune system. The essential oils of ylang-ylang, lavender and chamomile will not only improve the skin’s immunity but also impart a soothing effect. For a tonic-like effect on your dry skin, the essential oils that can help include lemon, geranium, bergamot, rosemary and juniper. Essential oils of rosewood, myrrh, neroli, orange and cypress are the common ingredients of beauty products for people with dry skin. Other essential oils that can be added to the previous list include bergamot, lemongrass, lavender, grapefruit, clove and rosemary. These essential oils when added to a carrier oil and massaged into the dry skin will improve the skin’s metabolism and replenish it with oxygen and nutrients. Essential oils of lemon, juniper, geranium, rosemary, jasmine, rose, lavender and chamomile impart a calming and relaxing effect on the skin. If you have dry skin with wrinkles, essential oils of lemon, orange, myrrh and patchouli can smooth out fine wrinkles. More often than not, dry skin lacks elasticity, which often results in wrinkles and excessive oxidation of the skin. 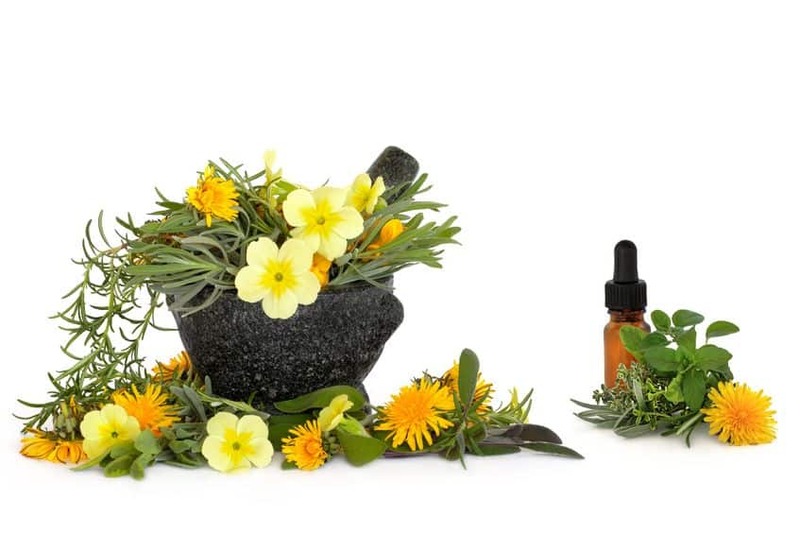 Essential oils are able to block the oxidation process, strengthen the cell membranes and allow the skin cells to obtain the nutrition they need. 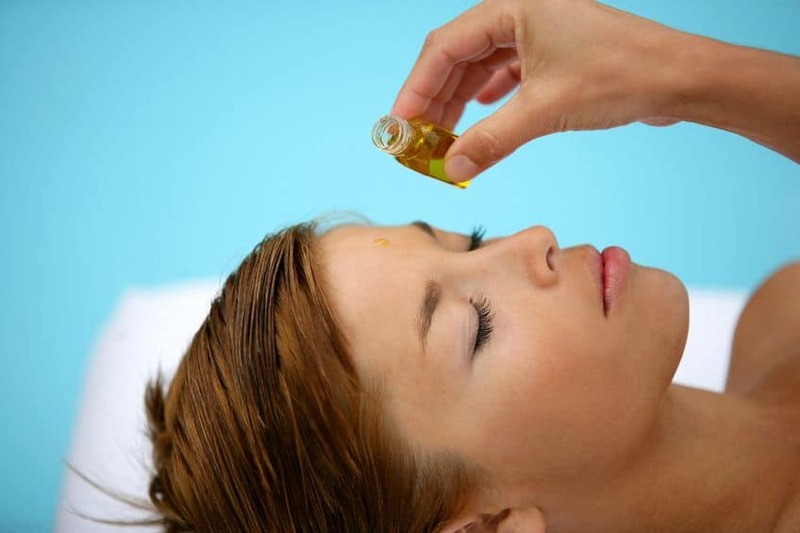 For fine wrinkles around the eyes, I often use essential oils like frankincense, pine, myrrh, sandalwood and neroli. For coarse wrinkles, I would suggest using ylang ylang, fennel, frankincense and myrrh. For stretched and sagging skin, use sandalwood, rose, frankincense, neroli and nutmeg. For clogged pores, use the essential oils of lemon, fennel, thyme, mandarin, bergamot, marjoram and juniper. If you are suffering from acne on dry skin, use anti-inflammatory essential oils like pine, cedar, juniper, bergamot, lavender, chamomile, clove and eucalyptus. For pigmented spots and freckles on dry skin, you can use essential oils of lemon, rosewood, chamomile and grapefruit. Adding 3-4 drops of essential oils per liter of bath water will not only hydrate your skin and smoothen it, but also improve your complexion. Essential oils may be added to creams, facial masks and balsams that you use everyday. I generally add 2 to 3 drops of essential oil per 5 ml of cream. While you can blend the essential oils with the whole container of cream, the best option would be to add them just before use as that gives you an opportunity to add different essential oils depending on the objective you are trying to achieve. When solving your dry skin problem, using balms enriched with essential oils can really help. In an empty dark glass bottle, add 10 ml of sweet almond or grapeseed oil and 2-3 drops of the essential oil of your choice. Use this aromatherapy balm as your daily eveningwear. The metabolism of the skin is worst during the night, so applying these balms at night can provide much needed moisturization of the dry skin. This will also help you fight skin dryness during day time. Have you always wanted to have a guide to deal with your dry skin woes? I am talking about a step-by-step guide for day time and night time routine including cleansing, exfoliation, toning, anti-ageing, moisturizing, etc. You will also get recipes for weekend skin indulgence and emergency dry skin treatment, not to mention an easy-to-follow 90-page guide. What Essential Oils Should I use To Help My Skin Regain Its Lost Moisture? The essential oils of sandalwood and palmarosa offer excellent hydration properties to the dry skin. While moisturizing the skin, both these oils are also known to balance the oiliness of the skin. Blend 30 ml of jojoba oil, 7 drops sandalwood and 7 drops of palmarosa essential oil in a glass bottle and mix the ingredients well. Apply 4 drops of the blend with the help of a dropper on your wet skin and massage with fingertips. Follow this procedure at least two times per week. In order to moisturize a larger portion of your skin, you can take a warm water immersion bath, with 12 drops of essential oil of sandalwood and 12 drops of essential oil of palmarosa. If you don’t want to endure the above procedure, there is always a second option. My own L’orpur Deep Moisturizing Cream which is suitable for dry and sensitive skin. You can make up your own cleansing cream for dry skin using a blend of rose water, aloe vera, palmarosa essential oil and rose essential oil. In addition to cleansing your skin, the above blend will provide much needed nourishment and moisturization. Blend 50 ml of rose water, 30 ml of vegetable glycerin, 60 ml of aloe vera, 5 drops of essential oil of palmarosa oil and 5 drops of essential oil of rose in a glass jar and shake well. Use this blend to cleanse your skin and wash it with lukewarm water at the end. In order to moisturize the larger portion of the body, just immerse yourself in a warm bath tub and 10 drops of palmarosa and 10 drops of rose essential oils. Pregnant women too can use this immersion bath for moisturizing their dry skin. 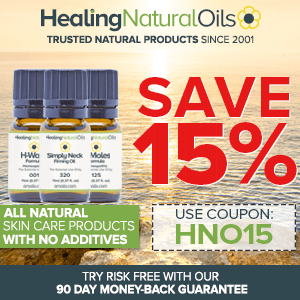 Mix 4-5 drops of lavender essential oil with a carrier oil such as jojoba or almond oil. Jojoba is one of the best healing oils and it is very similar to human sebum, which dry skin lacks the most. Mix this blend in a non-fragrant lotion containing lanolin. Lanolin has the ability to hold the oils and moisturize your skin. Use unscented lotion only because fragrances in some lotions will cause skin irritation. Rub the blended lotion on your face and gently massage in circular motions. Stay out of the “T” zone of the face (forehead, nose and chin), especially if you are prone to acne in these areas. Apply this lotion on your face before going to bed. When using essential oils on face, it is important to be extra cautious, especially if it is the sensitive areas of your face. These plant oils are concentrated and can cause complications if not prepared properly. Please exercise caution when using essential oils and you can comfortably use them on your face and always remember to dilute essential oils in a carrier oil. Blend 1 cup of ready clay with 4 drops of lavender essential oil, 2 drops of geranium essential oil, 1 drop of essential oil of patchouli and 1 tsp of olive oil. Apply the mixture on the face, leaving it in position for 20 minutes. Add 5 drops of lavender essential oil in a bowl of warm water. Soak a cotton pad and apply on face for 5 minutes. Do this once a day. If you are using the compress daily, you can switch to oils like geranium, patchouli and rosemary. How To Treat Aged Dry Facial Skin Using Essential Oils? With increasing age, wrinkles, discoloration and breaking of blood vessels is a common scenario for people with dry skin. Massages based on aromatherapy can really help in this situation. Here is a massage recipe to treat aged dry skin. Add in a bowl of hot water 2 drops of essential oil of lavender + 3 drops of essential oil of geranium. Cover your head with a towel and allow the steam to unclog facial pores; do this for 5-8 minutes. 30ml of jojoba oil + 3 drops of lavender essential oil + 5 drops of essential oil of Geranium. 30ml of sweet almond + 4 drops of essential oil of patchouli + 2 droplets of essential oil lavender + 2 drops of essential oil of rosemary. If you want to have a healthy looking skin that is soft and in perfect condition, forget creams and beauty treatments, and opt for what is natural as in the case of essential oils. Besides being economical and natural, they are the best remedy you can get for your issues related to dry skin. Everything you wrote about I have. I want to know if I can mix all the oils together to put on my face at night. Literally I have large pores extremely dry skin. Flaky skin. Deep wrinkles. Oily t zone. Rosacea. Cyst. Broken veins. On and on. Indeed, you could add the 3xEOs: patchouli, rosehip and palmarosa to a carrier oil (approx. 15 drops essential oils total in 1 ounce carrier oil) and apply to the affected areas. If any more issues, please don’t hesitate. The dry skin issue can be control immediately by applying a hemp seed oil on the skin daily according to the required period of of a time after the recommendations of doctor and understand the important guidelines which is helpful for you to eliminate this kind of problem easily ,keep it in your before applying hemp seed oil on the body make sure all the water is removed and avoid to work in the light of sun because the rays and heat of sun damaged the upper layer of skin and increase the cracks after some time of working in a sun light you notice your skin become dry and also the color of skin will be changed . I have a problematic skin it’s very dry flaky red sensitive skin. Any products I use doesn’t suit me.Pls can you suggest some essential oil remedies for the same as I am new to aromatherapy. Can you please let me know if you want essential oil remedies for your facial skin or for your body skin in general. Do you have any related issues such as eczema or similar and if so, have you consulted a doctor about it. It is best that I know the info before advising you further. Olivia it’s me Cindy again , in one of your articles you mention a warmer for oils like maybe a candle warmer I think where I might put a tea candle in the bottom and an essential oil with water in the top bowl . Is this what you men’t ? I cant remember which article I read it in but I wondered if using this method as an alternative to a diffuser is still ok for the oils and would they still keep their integrity ? I hope you are doing great. Indeed, you can use a candle warmer precisely like you have described it. Just remember that the water and essential oil will evaporate with time, so just keep an eye out and refill as required. The EO’s will lose some of their efficacy, integrity and beneficial properties, however if you are simply using for scent, then that does not really mater. Also remember that EOs have already been exposed to very high heat (not through a flame though) during the steam distillation process when they are being manufactured. I do that from time to time and it works perfectly fine for scenting a room or living area.